At the heart of many films by François Truffaut, there is a flawed but humble and tragic male figure that often gets into trouble or worse, has his heart broken. There’s no doubt that Truffaut, himself a gentle and misunderstood director, projects himself into his many flawed men of his films, whether it’s troubled youth Antoine Doinel from The 400 Blows or women addicted Bertrand Morane from The Man Who loved Women. His 1960 film Shoot the Pianist presents us with perhaps his most tragic yet likable character in his whole back catalogue. This was made in the days before his slip about Britain being incompatible with cinema and before he was casually alienated by the cinematic press; so perhaps Truffaut was born a tragic figure. 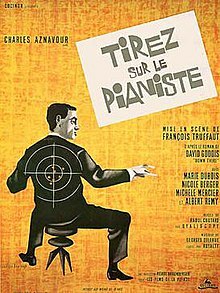 Our tragique in Shoot the Pianist is pianist of said title, Edouard Saroyan, who is forced to play piano in a seedy jazz bar after a breakdown due to his wife’s suicide. Edouard was on the steady rise to fame as an acclaimed classical pianist but through use of recapping half way through, we learn of the deterioration of his relationship with the woman he loved and her eventual suicide through evocation of the past. However this is merely a side story in the tragedy of Shoot the Pianist; a mere scene setter. A lesser director could obsess over this aspect for a whole film (and no doubt there are countless copies) butShoot the Pianist is, at its heart, a crime thriller stuck in the vision of a hopeless romantic. Edouard, now goes by the name of Charlie to avoid embarrassment, but this doesn’t stop his crook brother Chico from finding him and begging for refuge while he’s on the run from two gangsters he’s betrayed. In terms of narrative, the film could work easily as a film noir. Charlie’s dead wife seems to have elements of a demanding femme fatal at her core while there are plenty of shoot outs, car chases and even the title has a Chandler-esque vibe. Yet this is a film still in the grip of the innovation of the French New Wave. It’s clearly made in the era of Godard’s Breathless (which Truffaut himself co-wrote) and the desire to be visually inventive takes a hold almost instantly as the film opens. Georges Delerue’s superb score washes over the opening credits of a shot of moving piano strings beating out the dead end rhythm of the dead end bar. The film is filled to the brim with visual tricks that have clearly had an effect on other filmmakers. It’s impossible to imagine Amelie’s experimentation with compositions without Shoot the Pianist’s initial, almost cartoon like methods of filling in the detail of the story. When recalling a past conversation, a character appears on screen in three separate circles, displaying a Warner cartoon like playfulness. When George Delerue’s character is forced to sing, to hide the imminent stress of the scenario building in the bar, the lyrics appear on screen, asking the audience to sing along and become part of the world in which Charlie inhabits. Its influence can be seen from Jean-Peirre Jeunet to Richard Ayoade’s Submarine, a film obsessed with little quirks of the Truffaut mould. With a final shoot out in the snowy woods of a wintery France, the film confirms a tragic fate for Charlie. Though not the fate that the title of the film might hint at, an unrequited love blossoming throughout the film is real source of the film’s final tragedy and one perfectly in tune with the broken-hearted lovable director whose natural allure with tragedy was always positive for screen perfection.